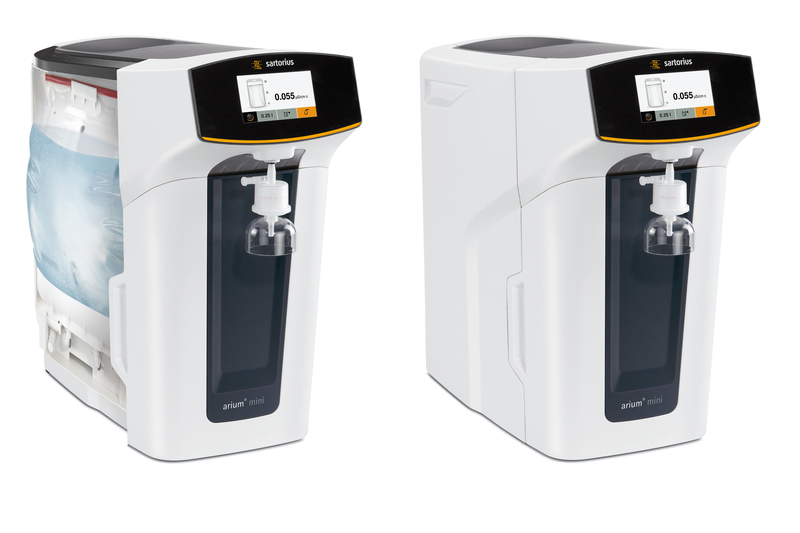 With arium® mini, the laboratory and pharmaceutical equipment supplier Sartorius offers an especially compact ultrapure water system. This newly developed system delivers a flow rate of one liter per minute and is specially designed for ultrapure water requirements of less than 10 liters per day. This space-saving unit with a width of only 28 centimeters (11 inches) easily integrates into nearly any lab environment. Feed water needed to produce ultrapure water is supplied by the 5-liter bag integrated on the side of the system. Originally developed for the pharmaceutical industry, this bag is optimal for storing purified water. The closed bagtank system prevents secondary contamination while ensuring consistent long-term water quality. Uncomplicated exchange of the bag also facilitates upkeep of the system and considerably reduces maintenance time compared with conventional tank systems. The bagtank does not require any hazardous cleaning chemicals, further increasing user safety as a result. Besides its unique bagtank technology, the system is equipped with a high-resolution, touch-activated color display. Easy-to-understand icons guide the user intuitively through the menu. The Favorites function automatically stores the volume of ultrapure water last dispensed. This prevents errors during repeated dispensing of identical volumes, helping to increase the reliability and efficiency of lab work procedures. The standard version of arium® mini is independent of a permanently installed water tap. Water is supplied to this system via the integrated bag, which is filled by a built-in pump. In the process, pretreated water is pumped into the bag automatically and is thus used as feed water for the production of ultrapure water. The version with expanded features, arium® mini Plus, can be directly connected to a feed water tap, by contrast. In this system, feed water is treated first by a pretreatment cartridge, which consists of a combination of activated carbon and a reverse osmosis module, and is safely stored intermediately in the integrated bag of the system. Final production of ultrapure water then takes place using a specially developed arium® Scientific purification cartridge. For analytical and especially critical applications, such as HPLC, arium® mini also can be optionally ordered in a version equipped with an integrated UV lamp (185/254 nm). This ensures reliable production of ultrapure water that is virtually free of organic components.